The 14th Annual Harris Family Reunion convened this past weekend in South Tulsa/Bixby, led by the family patriarch, 96-year-old lifelong Bixby resident, Rev. 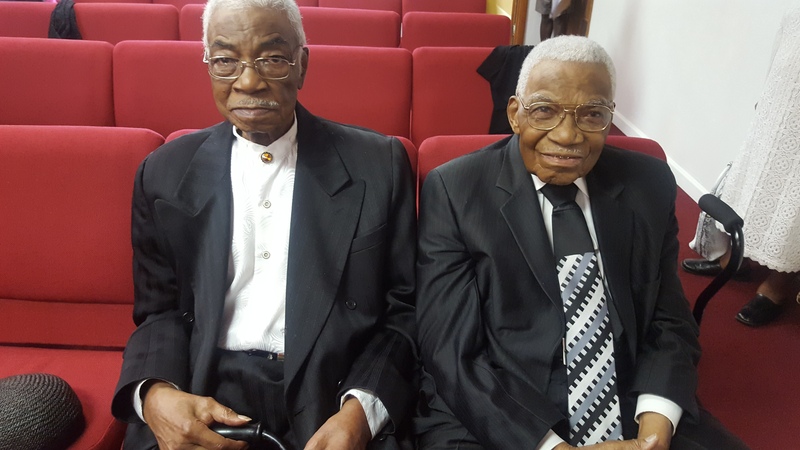 Walter B. Harris and his younger brother, 89-year-old Tulsa resident, Willis J. Harris, Jr. The weekend began on Friday with a Meet & Greet reception at the Holiday Inn & Suites, South Tulsa/Bixby. Family members began arriving from Arlington, TX., Wichita, KS, Oklahoma City, Chicago, IL, Okmulgee, Atlanta, GA and the Tulsa area. After having time early Saturday to explore the area, the family assembled for the Saturday night banquet, with a Harlem Nights theme. A fun night was experienced by all, young and old, as the ladies arrived dressed in their sequins flapper dresses, headpieces, rhinestones and pearls; and the gents in various style suits, vests, suspenders and gangsta hats. A delectable, scrumptious soul food dinner of greens, potato salad, fried chicken, smoked bologna, mac & cheese, and much more was provided and served by G-Mama Catering (Lisa McClellan & Sharon Vann – (918) 378-8534 & (918) 982-8020). With a full program, family talents were displayed via speaking singing, dancing and playing musical instruments. There was a moving memorial to celebrate deceased family members, complete with their pictures displayed as centerpieces. The Keynote Speaker, Cheryl Robinson, captivated minds and hearts as she spoke on the topic, “Where There is Family, There is Strength”. It was especially moving when she talked about having grown up in California before moving to Oklahoma City some years ago and “discovering” her Harris family in 2013, after which she attended her first Harris Family Reunion. The weekend events culminated with the family attending Sunday morning church service at Holsey Chapel C.M.E. Church – 1804 E. 48th St. N., Tulsa. The church’s pastor, Rev. Gregory Chalk, truly blessed the congregation with his sermon entitled, “How Deep is Your Love”, based in New Testament, John 13. After service, the family fellowshipped together at the Golden Corral before parting ways to return home. When asked what his favorite part of the reunion was, Rev. Harris emphatically replied, “Everything!” paraphrasing a quote, “Family is not just an important thing, it’s everything!” He went on to say, “I always look forward to reuniting and visiting with old family members and meeting new ones.” Rev. Harris stated he is already looking forward to next year’s reunion.